Mimbalot Falls is one of the 39 amazing waterfalls in Iligan City. 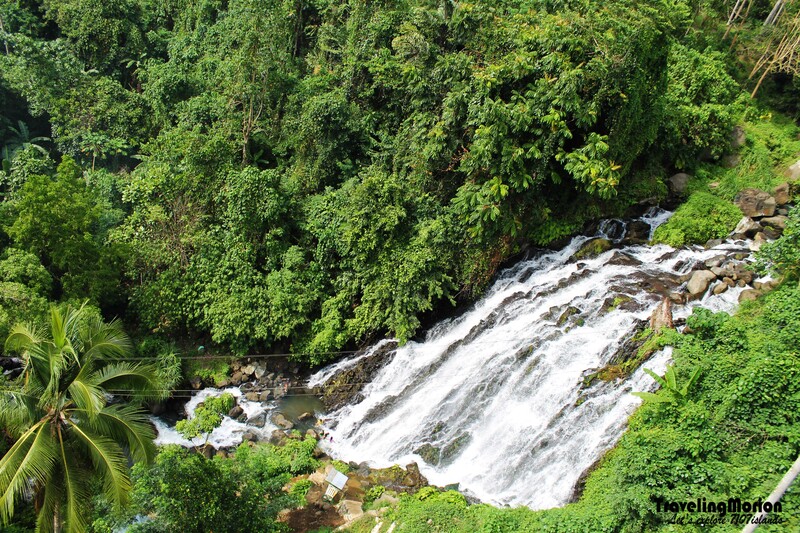 It also belongs to the so-called Tourism Triangle in the city, along with Tinago Falls and the Maria Cristina Falls. This place is a great spot to visit especially for nature lovers who enjoys virgin beauty. The lovely Mimbalot Falls cascades down a path with lots of large rocks, forming smaller rivulets and mini waterfalls. The area immediately under the waterfalls can be dangerous for swimming especially because of the large rocks and the strong force of the cascades. Still, if you tread carefully, you can enjoy the pounding cascades up close and personal – perfect for a photo op! Those who do love to swim in the cool waters of the waterfalls can do so in many of the pool basins down the falls. Swimmers are advised to take extra caution when treading the rocks because many are quite slippery, especially in the shallow areas. There could also be deep spots in these pool basins so that non-swimmers and kids should never be left unattended. It would be best for them to bring along a life jacket or other life saving device. Remember, there are no lifeguards in this area and you could seriously injure yourself if you become careless. Everyone is warned not to take a dive especially if you haven’t tested the water yet for its depth or the presence of rocks. Never leave the kids unattended in any part of the waterfall or its immediate surroundings because many of the rocks are slippery and they can fall into the rapids. 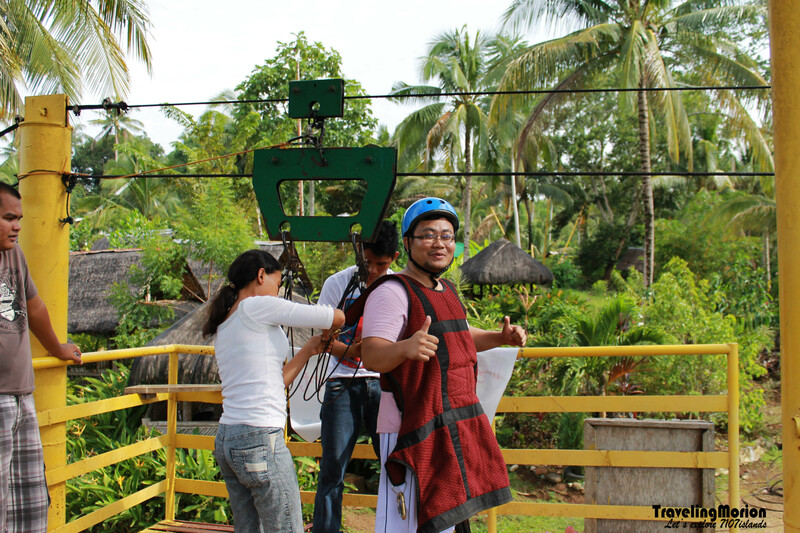 It's Traveling Morion's first Zip Line ride - to witness and shoot the perfect view of Mimbalot Falls. Because this area is not very developed, you’ll find no stores or restaurants in the vicinity. You do have to bring your own provisions. There are some picnic tables by the falls for tourists to enjoy a picnic while marveling at the views. The concrete tables and benches are quite unique because these are set over a shallow basin so that you get to dine while the water gently laps at your feet. The waterfall is a popular spot for locals to bathe and wash their clothes – you can easily chat with them or ask additional info about the area and other nice spots to visit in the vicinity. Mimbalot Falls is the city’s most accessible waterfall, with its location just 500 from the highway. 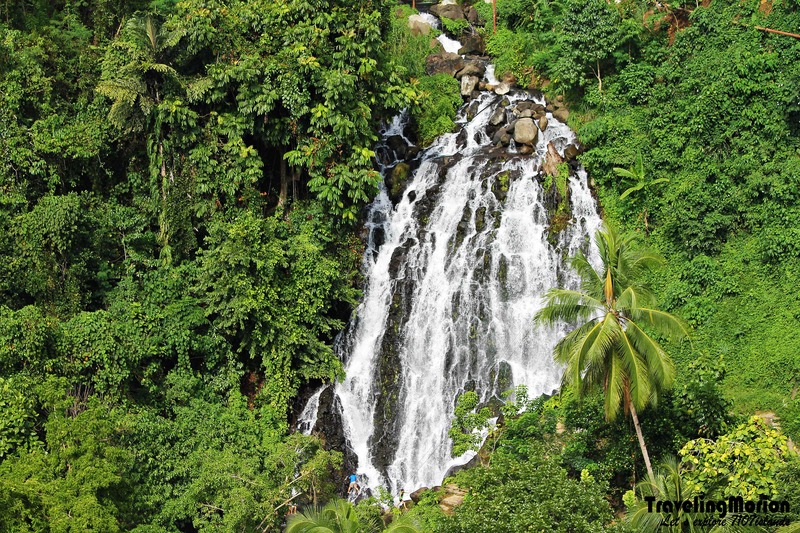 The waterfall is actually part of Iligan Paradise Resort and Eco Park where you can find a number of fun activities to enjoy. Inside the resort, you can also enjoy zip line rides over majestic views. The zip lines come with different harnesses that you can choose based on your own preference. You can try the single harness or the superman. Those who would love to try the zip line but afraid to do it alone can ride in tandem secured on a double harness with a companion. There’s also cable car where you can ride to enjoy the stunning views without the added adrenaline rush experienced in zip line rides. It is also possible to enjoy tours across the resort aboard all-terrain vehicles (ATVs) for a fee. Dirty biking is also available in the resort. There are also various water activities to try within the resort. There’s tubing and kayaking for you to enjoy. Different kayak sizes are available for rent, with 1-seater, 2-seater, and 3-seater kayaks available. Let the kids enjoy horseback riding. They can also have a good time at the children’s playground where they can try the Indiana Jones, monkey bars, slide, and swing to their heart’s content. You would have to take a short trek from the resort to reach the falls. The jaunt will bring you down a winding staircase but it is not as taxing and long as the 500-step staircase leading to Tinago Falls. Tired from the activities in the eco-park or after the trek down the falls? You can always relax in the cottages and simply enjoy the lovely views. Did you know that more adventurous nature lovers and outdoor enthusiasts can take a 2-hour trek along the river from Tinago Falls to Mimbalot Falls? It is something to consider if you have lots of time to spare and would love the challenge. Also, the views are wonderful but the trek can zap your energy especially if you are not very fit. If you are up to the challenge, be prepared to get wet along the way so make sure to bring extra clothes wrapped in waterproof bags so you can change at the end of the river trek. Of course, the river trek is not commonly done by tourists because of its dangerous nature. You don’t have to be compelled to do it because there are plenty of public transport options available to shuttle you between the falls within just a few minutes. Read the detailed Iligan City Trave Guide here. From Iligan City, ride in a jeepney bound to Barangay Buru-un. Tell the driver to drop you in Miguel Canohoy Memorial School. Cross the road and walk for more or less 10 minutes to reach the waterfalls. Fare is 13- 15 Php only. You can also hire a habal-habal from the city proper to go directly to the location. Bro, envy naman ako sa iyo. Baka pwede akong sumabit sa mga trips mo. BTW, ganda ngfalls na ito, malamig ba ang tubig. Gusto ko sanang maligo. Amazing indeed even in pictures....really beautiful! There is something so captivating about waterfalls. I dream of visiting places like this. I have been to Iligan city early this year but i never heard about this falls from the locals, unless the one i've asked didn't know this yet...wish to visit this too once we visit the place again. I have never been to this place before.. looks like something we need to check out! The view is breathtaking. Love the falls! The waterfalls captured my heart. I instantly told my husband that we should go to this place someday. Such a beautiful place. Thanks a lot for always touring us around the Philippines, places that I haven't visited! I've never seen a waterfall in real life. Is this a child-friendly place to visit? Yeap it's safe for children Gene :) But I also advise strict guidance. This in Iligan? Wow! I have only been to MaCFa! I just heard about this. Such a must-visit place! Thanks for sharing! Thanks to your travel posts, I get to see a lot more about Mindanao. I grew up in Davao City, moved to Cebu, lived in Bohol, and now in Canada, and yet, I have not known a lot about my country!! What a shame on me! lol! Anyway, love the falls! I miss the falls near our place in Bohol. this is exactly where the "it's more fun in the philippines" is true. even here in our place, there's still areas that are yet to be discovered, as we call it, it's still virgin, in the sense, tourists hasn't explored the place yet, so when we visited one, amenities are very limited. however, these undiscovered places are the best. It truly is lovely! So green...I envy going about nature trails and enjoying adventures not too often seen in urban areas....wow! This is what my cousin is telling me about. OH!!! Can't wait to get there! Mimbalut or Mimbalot falls is one of the amazing waterfalls in Iligan. Trekking to the falls from Tinago sure sounds exciting!